The horsetails are a class in the Pteridophyta (ferns). They were one of the most important plant groups in the Palaeozoic era. They are seen in the coal measures of the Carboniferous period, and some were trees reaching up 30 metres. The group is now almost extinct, but one genus survives. They are vascular plants that reproduce by spores and not by seeds. 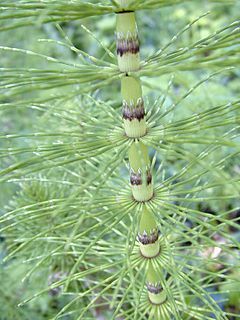 The name horsetail arose because the branched species somewhat resemble a horse's tail. The flowering plant genus Hippuris is not related to Equisetum, but looks similar enough that it is sometimes misidentified as Equisetum. Equisetum is the only living genus of horsetails. The name Equisetum comes from the Latin (equus = horse; and seta = bristle). The genus includes 15 species. Horsetails are native on all continents except Australasia and Antarctica. They are perennial plants, either herbaceous, they back in winter (most temperate species) or they are evergreen (some tropical species, and the temperate species Equisetum hyemale, E. scirpoides, E. variegatum and E. ramosissimum). They mostly grow 0.2-1.5 m tall, though E. telmateia can exceptionally reach 2.5 m, and the tropical American species E. giganteum 5 m, and E. myriochaetum 8 m.
In these plants the leaves are very small, in whorls joined together to make sheaths around the stem. The stems are green and photosynthetic, also distinctive in being hollow, jointed and ridged, usually with 6-40 ridges). There may or may not be whorls of branches at the nodes; when present, these branches are identical to the main stem except smaller. A superficially similar flowering plant (Hippuris, "mare's tail", in the family Plantaginaceae), unrelated to the genus Equisetum, is occasionally misidentified as a horsetail. Strobilus of Northern Giant Horsetail (Equisetum telmateia subsp. braunii), terminal on an unbranched stem. Microscopic view of Rough Horsetail, Equisetum hyemale (2-1-0-1-2 is one millimetre with 1/20th graduation).The small white protuberances are accumulated silicates on cells. Horsetail Facts for Kids. Kiddle Encyclopedia.